So after months of waiting, did the movie live up to our high expectations? YES! We loved it. The LEGO Batman Movie is action-packed and packed full of awesome one-liners, with plenty of inferences just for the adults in the audience. It was good, clean entertainment for everyone in our family. I have a feeling we will be quoting this movie for quite a while. We’ve even talked about using The LEGO Batman Movie for our family Halloween costumes this year. 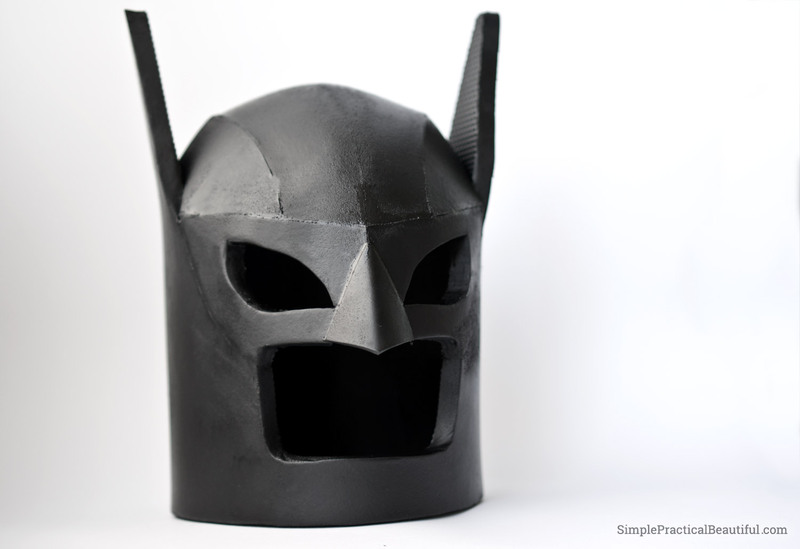 And since we might be using The LEGO Batman Movie for costumes, we created a LEGO Batman helmet. 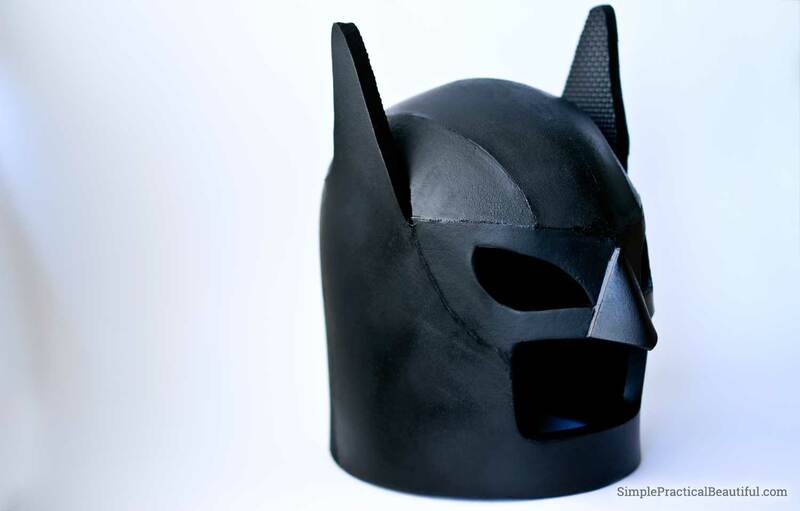 Technically, it’s Batman’s cowl or “armored face disguise,” and it’s Batman’s signature costume piece. He even wears it while lounging around Wayne Manor. Creating the template for the helmet was definitely the hardest part of the whole process. We went through many versions, and build several out of paper, cardboard, and foam. We wanted the helmet to fit our kids’ heads without being too tight or too loose. After much trial and error, we finally came up with a helmet that fits well and looks like LEGO Batman. You can download the free pattern here. (just fyi, I use the words “template” and “pattern” interchangeably). 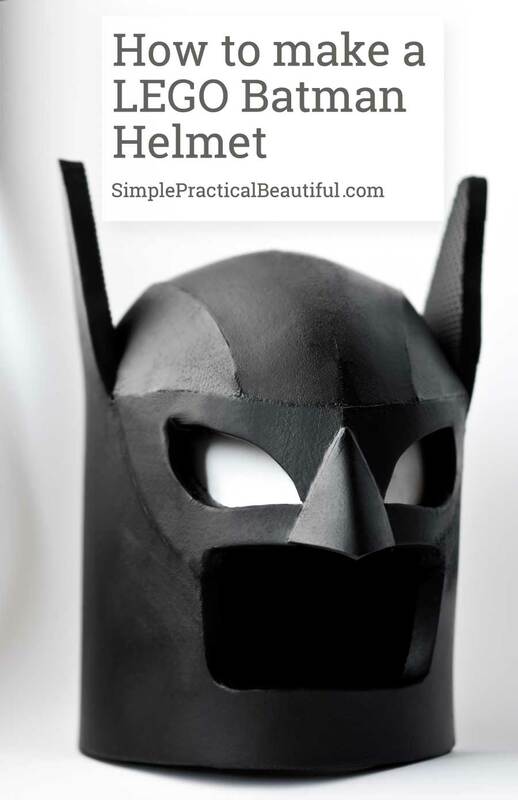 With our free LEGO Batman Helmet Template, you just need to follow the instructions below to make your own Batman cowl. You can enlarge the template slightly or reduce it slightly if you want to adjust the fit, such as for an adult head. This post contains affiliated links so that you can read more information about these supplies, and so I can earn a small commission at no cost to you. Print out the template and tape together the different pages until it creates all of the pieces. Cut out each piece. 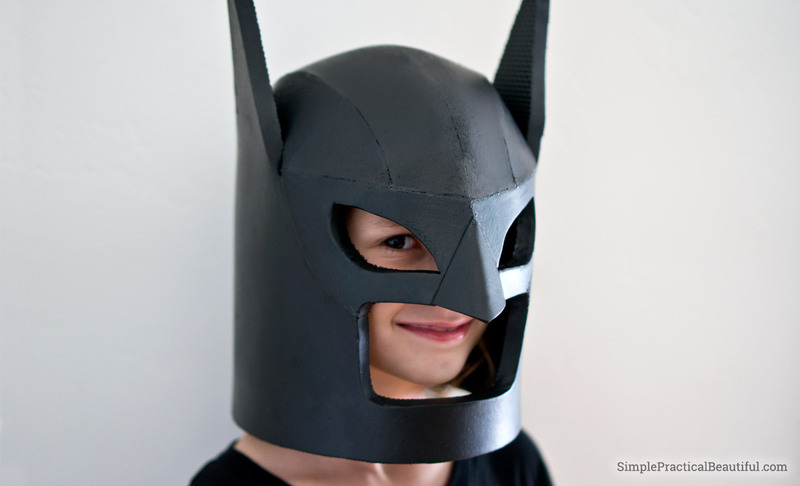 You should end up with 5 pattern pieces for the LEGO Batman helmet. 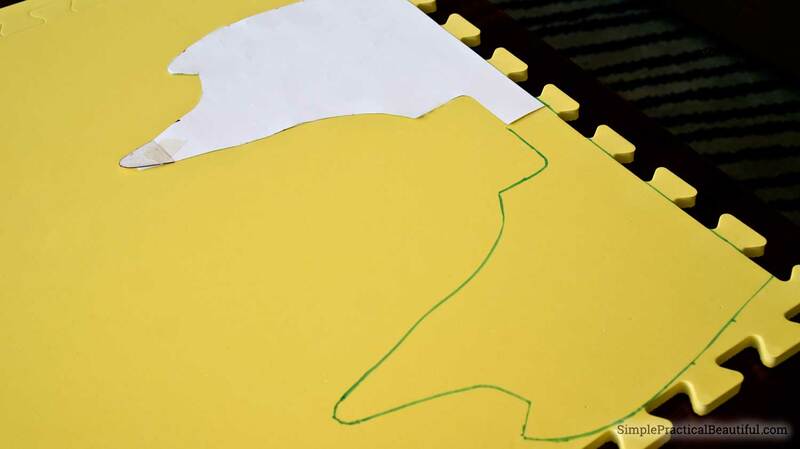 Place the pattern pieces on the foam and trace them out. Templates #3 and #4 are pretty big pieces so make sure to trace them first. For template #1 and #2 you need to trace two pieces that are a mirror of the each other (ie. one right eye, one left eye). Template #5 should be cut out of thinner foam. Make sure to mark where the registration marks are so your helmet pieces will line up correctly. Cut out pieces of foam. I tried a box cutter but I found it harder to control, so I used my smaller X-acto blade. Cut straight along each line. I found the best way to cut foam is with a really sharp blade. Make sure to cut your edges with the blade straight up (or 90 degrees), unless the template says otherwise, so the pieces will glue together well. 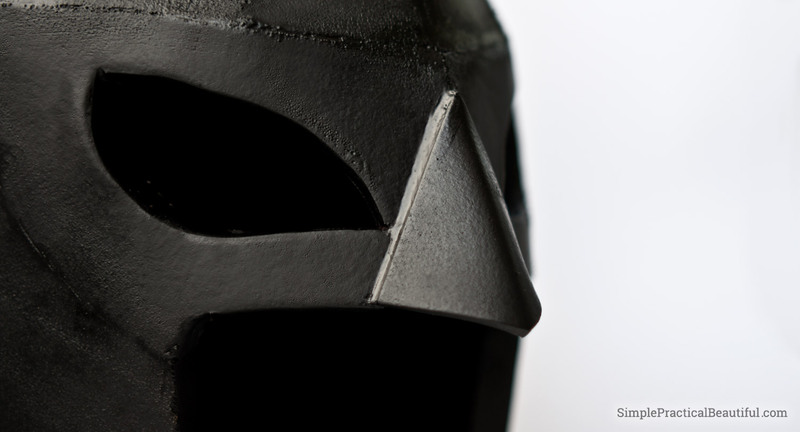 To help create the sharp angles on Batman’s mask, cut template #1 and 2 at 35 degrees along the marked edges. I did this my using my band saw. You could also just cut at an angle with your X-acto knife. 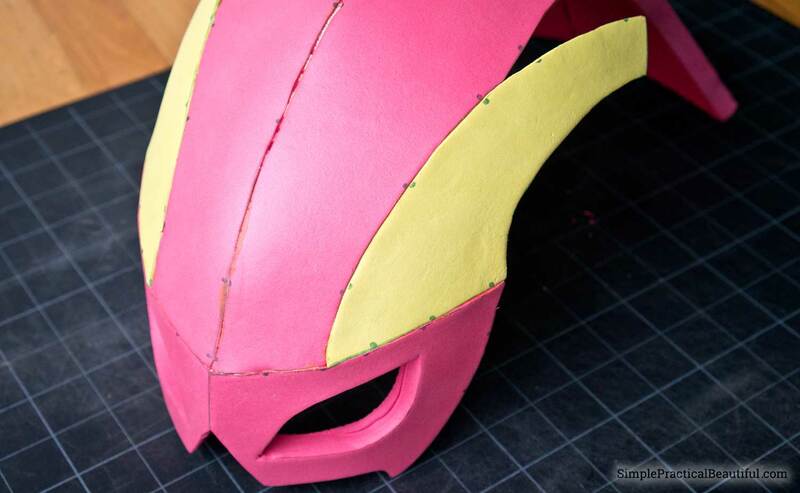 Heat seal the foam with heat gun and begin to bend the pieces to add some rounded shape. Do one piece at a time, heating the front and the back. I wore a glove because the foam starts to get hot. Once the foam starts to become pliable, that’s when I would bend it. Start with template #3, and glue the pieces together with contact cement. Apply contact cement along the inside edge from point “D” all the way to point “J” on both sides. Make sure to get full coverage and make sure to let the contact cement completely dry (You can read my post on making furniture pads for more info on using contact cement). Then, working from point “J”, start to line up the registration marks and apply pressure connecting the two sides. Do the same steps on the other side of template #3. Apply contact cement on both sides of template #1 from point “D” to where the nose hole is. Start at point “D” and glue template #1 together. Apply contact cement from Point “D” to “B” on both Template #1 and #3. Because of the 35 degree angle, I found it best to line up the front side of the foam then apply pressure to connect the whole piece. Next glue Template #2 to Template #1 from point “A” to “B”. Then apply contact cement from point “B” to “E” on the two pieces. Line up the front edge, then press together on the inside of the mask. Glue Template #4 to #1. Start at point “I” and then press together until you get to point “A”. Work slowly and only do one side at a time. Once both front parts were connected I glued the edge next to point “E”. Don’t apply glue any glue along the slope that goes next to the ears. Then glue down the back from point “E” to the “H”. Make sure to use the registration marks as you go down the edge, but if the bottom hangs out, it can be cut off. Score (cut lightly, but not through the foam) and fold template #5. 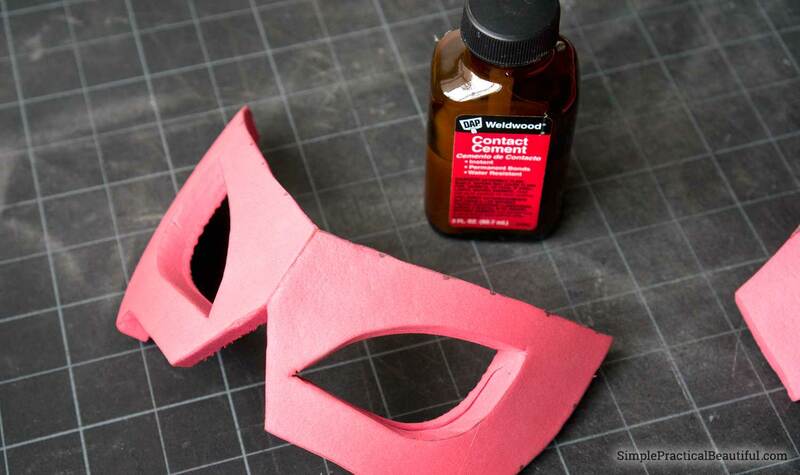 Glue on to the front of the mask by applying the contact cement and aligning the nose to the bottom edge of the mask. 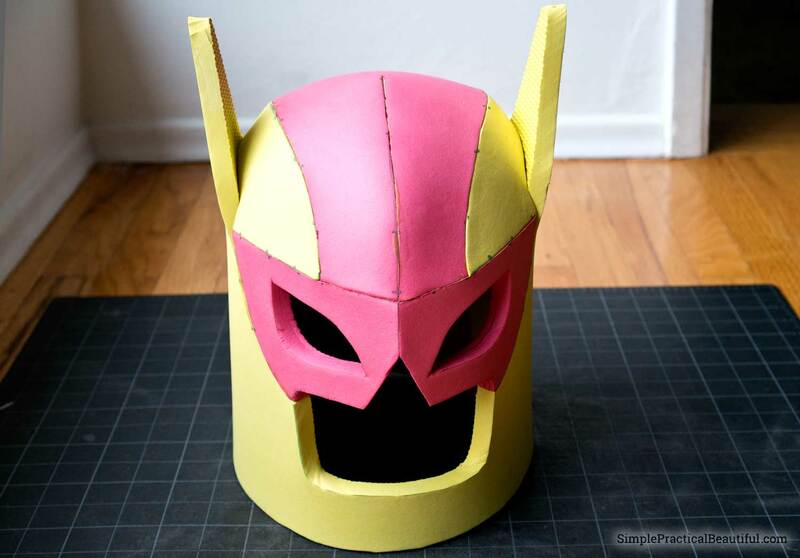 Once the LEGO Batman helmet is all glued together, use sanding sticks (sandpaper glued onto a wood stick) to sand off edges and bumps on the seams. The sanding will make the foam get fuzzy, so start with lower grit paper then progress to higher numbers. Once you get to the highest number you will need to seal the foam with the heat gun again. Just be careful to not do too much heat because it will cause the glue to come apart. Using Kwik Seal and the X-acto knife, wipe caulking into any gaps in the seams. Apply multiple coats if you need to. 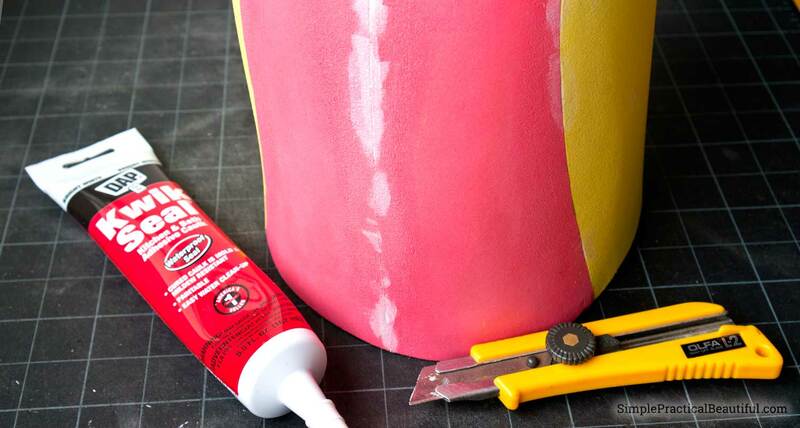 Apply the caulking in thin layers and make sure to wipe off any extra because it will show up after the helmet is painted. Seal helmet to prepare it for panting by coating it with black Plasti Dip (a rubberized spray). I did about 5 coats to make sure I covered everything well. Finally, spray the helmet with a coat or two of black gloss paint until you have good coverage and a shiny black helmet. A lot of the techniques I used in this tutorial, I learned from Evil Ted Smith, a professional prop maker and foam artist. 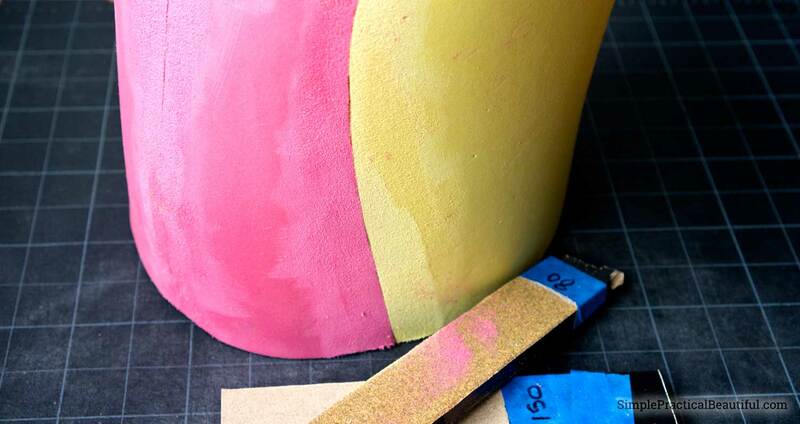 You can visit his website or watch his YouTube videos to get more detailed instructions on how to work with foam. Here’s Jane wearing the LEGO Batman helmet. She’s being Batgirl. It fits her really well (her head is about 21 inches around). The helmet doesn’t fit onto my husband’s head and it’s too big for my toddler. But everyone is having fun trying it on. And quoting lines from The LEGO Batman Movie. Wow…. this is amazing!! My son would’ve killed for me to make this for him when he was little. Thanks, Danielle. Both of my daughters love it, and there have been some arguments about who gets to be Batman (or actually Batgirl). My husband had fun making it, so I see lots more foam costume pieces in our future. Costumes are so much fun, especially one of a kind ones like this. Love the big grin from your little one its obvious she is happy with her new outfit. Thanks, Leanna. My whole family had a lot of fun trying on the helmet and pretending to be Batman. I was glad I got the great picture of my daughter enjoying it. Frist time I use vinyl to coat the helmet then I found Plasti dip is more flexible and there are many tool to help you remove plasti dip easily! Nice project you’ve shared.